1871 must have been a rough year for a certain Charles County physician. In late March of that year a few of the regional newspapers carried stories about the apparently successful suicide of Dr. Mudd who played a small role in the story of Lincoln’s assassination. 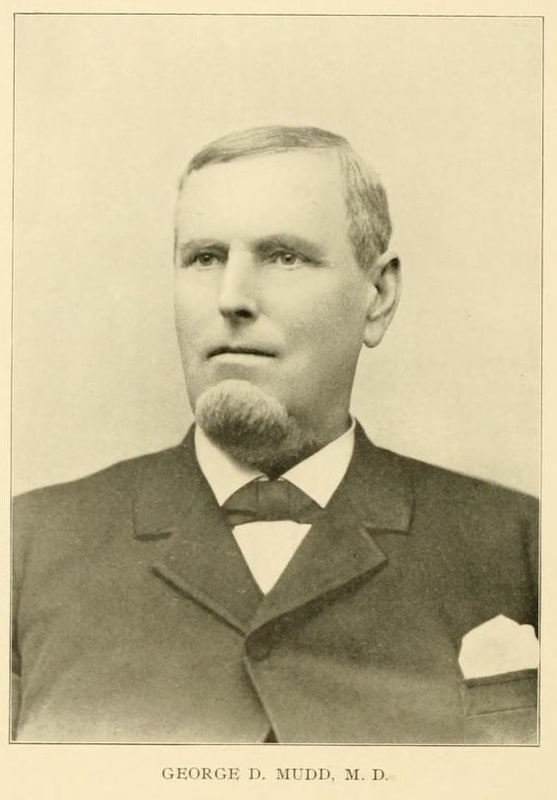 The Dr. Mudd reported to have committed suicide by cutting his own throat was not Dr. Samuel Mudd, but rather his second cousin, Dr. George Dyer Mudd. This “other” Dr. Mudd was actually the elder of the doctors Mudd. George even sponsored his younger cousin, Samuel, when the latter was applying for his doctorate in medicine. Unlike his younger cousin, Dr. George Mudd was a Union supporter during the Civil War and as such was well liked and known among the Union soldiers who occupied Charles County. It was likely due to this reason that Dr. Samuel Mudd chose to confide to Dr. George Mudd that two “strangers” had come to his house on the morning of April 15th, after the assassination of President Lincoln. Samuel told this to George on April 16th, when both men attended Easter Sunday services at St. Peter’s Church. Dr. Sam hinted to Dr. George that he was worried that these two men might have been connected with Lincoln’s death, but did not put too fine a point on this suspicion. George Mudd said he would tell the authorities, but did not actually report the news until the next day. The authorities eventually followed up on Dr. George Mudd’s lead, and pretty soon the whole family’s name was Mudd due to his younger cousin’s well established acquaintance with John Wilkes Booth. Despite what the papers initially reported in March of 1871, however, Dr. George Mudd did not succeed in his attempt to kill himself. A correction was quickly published. Dr. George Mudd recovered from his suicide attempt and it does not appear he ever tried to take his own life again. Instead, two years later, Dr. George Mudd enter politics and was elected as a state senator. When he was re-elected to the legislature in 1876, many newspapers confused him with his infamous cousin. Thanks for the interesting article. My understanding the reason Dr. Samuel Mudd tells Dr. George Mudd is true he wants him to tell authorities due to his Union sympathies connections and actually goes there for Easter Service instead of his own church (St Mary’s). But the real motive behind for doing this is that he is worried that his neighbors and surrounding community that has Southern sympathies will seek him out for revenge for turning in Booth. If what you report his conversation with Dr. George Mudd is correct and said he told him they were strangers then he lied to him. Dr. Samuel Mudd knew who Booth was but it’s true that he didn’t know Booth was going to assassinate the President Lincoln. What isn’t know is how involved Dr. Samuel Mudd was about the kidnapping plot that Booth attempted with John Surratt. There is no arguing that he turn the family name into Mudd! I also love the final resting place articles. If you run out of final resting places you can always do what happen to the bed people where found arrested in, sleeping in, or died on at today. Keep up the great work. Tim – Just a little clarification: Dr, Samuel Mudd’s family were congregants at St. Peter’s Church – not St. Mary’s. At this time (and even today) the Catholic Church assigned people to the church they were to attend. Dr Sam’s family was assigned to St. Peter’s and his children were baptized there. And, that is where Dr. Mudd’s family went for Easter Sunday services, not specifically because he could confide in his cousin, Dr. George. Dr. Sam, without his family, attended service at St. Mary’s Bryantown in November of 1864 because he had been summoned there by Dr. William Queen (a congregant of St. Mary’s and a leader in the support of the Confederacy in Southern Maryland) in order to meet John Wilkes Booth, who had arrived in the area with letters of introduction from high-ups in the Confederate line. I was just on one of our Surratt Society Booth Tours yesterday, and the question was asked, “Why are Dr. and Mrs. Mudd buried at St. Mary’s Bryantown if it was not their home parish? One logical answer is that St. Mary’s was the home church to Mrs. Mudd’s family, the Dyers, and Dr. Sam and “Frankie” had been married there (brides usually choose their wedding place). Since Dr. Sam died before Frankie, perhaps she wanted him buried in her family church. Re: The previous blog on Hartman Richter.. This man whose picture was taken by Alexander Gardner on the Saugus (as shown above in the two photographs) has a dark goatee beard with a thin beard line on the lower cheek jaw. Note also, he has a dark coat with a V shaped collar and baggy sleeves. He has thick, wavy dark hair and a flared nose. The V collar is distinctive having a light coloured braided edge. He has a white shirt and a light coloured waistcoat. He also has light coloured trousers. If you study the picture of the man hung next to Adzerodt you will see he also has thick, wavy dark hair. He has a long dark coat, a white shirt and light coloured baggy trousers. And his V shaped collar is also braided. He is short in stature and is a thin man. The only difference is – he is fully shaven. There is also a likeness to the drawing done by General Lew Wallace in the court room. Here Wallace gives us a man with a flared nose and a thin wispy goatee beard plus a thin growth on his lower cheek jaw. In the Lew Wallace oil painting however he gives us a small man with a full goatee beard, portraying him even more like the man on the Saugus. In the hanging picture we see a small man with no resemblance to Herold whatsoever. The 23 year old Herold was a stout man who could hardly fasten all the buttons on his waistcoat and is bursting at the shoulders of his dusty coat. The man who surrendered from the barn always denied he was Herold. Lt. Ruggles said he first gave his name as ‘Boyd’ when he met him at the Rappahannock River. Colonel Baker in his book 2 years later called ‘Herald’- the dupe. Indeed there are enough duplicate pictures of Herold to open a photographic studio. And take your pick on his name: Is it David Herold, David E. Herold, David Edgar Herold, David Harold or David C. Harold as put on the wanted posters in error and still quoted by Harper’s press weeks later? Therefore the unknown man quoted as ‘Name not disclosed. [Identified as Hartman Richter]’on the Saugus is more likely not Richter. Instead, could this man be ‘Boyd’ from the name he first gave to Ruggles at the river? It was changed to Herold, after his capture from the barn. Is this then, the man they hung instead of Herold? Good grief, Charlie Brown! I have discussed theories and speculations related to the Lincoln assassination with some “creative thinkers” in the past fifty or so years, but you, sir, are on your way to winning the trophy in that field. How extensively have you researched the Lincoln assassination? I wonder if he had second thoughts? I wish I was a creative thinker madam. I was trained as a Chemist and worked as an Industrial Chemist. But thank you for being so kind I think. Novelists and many ‘broad brush’ historians – have creative minds in literature – not like the plodding analyst. However there were many great creative Chemists-such as Mendeleev who formulated the periodic laws of elements and the existence and properties of elements undiscovered that fitted into his periodic table –from a dream they say. Rather like Friedrich Kekule’s dream of a serpent circle of alternating double bonds in the structure of the benzene ring and the birth of aromatic chemistry. Does your affinity for Otto Eisenschiml’s thoughts on the assassination derive from you both being chemists? I had long come to my understanding of this tragic affair before I came across Otto Eisenschimmel’s work. In any case there are others like Ray Neff who have uncovered far more than Otto. He was a very busy man and simply wrote his book with all the evidence he himself had aquired from documents etc. And as a scientist he happened to condradict the historians. And although he questioned the role of Edwin McMasters Stanton he does not appear to suggest that Booth was not the assassin. He believed that Stanton allowed the assassin(s) to escape over the Navy bridge.This might suggest the Intelligece Service was fully aware of Booth’s plan to kidnap the President, yet allowed an assassination event to happen. This especially with the 2 hour break in the military telegraph network -only 15 minutes after the hit, apart from the lines to the outlying forts and Old Point. This was conceded by Colonel Baker (head of the NDP) in his book. John Surratt in his lectures said he was shocked at Booth’s plan at first. He went along with it half -heartedly as did the others. After the failed attempt at the Seventh St Soldier’s hospital they all separated. And Samuel Arnold’s letter to Booth warned him the Government were aware of the plot to kidnap Lincoln. This letter was found in Booth’s trunk at the National Hotel and taken by the authorities/NDP along with all of his possessions. Even in Booth’s letters and as recorded by Baker, the plot to kidnap was entirely his own responsibility. Surratt even said they did not want the Confederacy to know. Indeed he thought it was a crazy idea because even if they were successful and took him to Richmond they might well be incriminated there. Especially as the war was over by the time of the event, as it happened. As a very busy scientist, Otto Eisenschiml did not do his history homework. While I could comment on quite a few of your points here, there is only one (this time) that really needs to be stressed. None of the military telegraph lines went down at the time of the assassination. They were up and running the whole time. There was one private line that was deliberately shut down by its owner. The reason is usually cited as being in order to prevent his line from being used by the conspirators – not knowing how widespread the plot extended at that early stage. Also, please remember that Col Lafayette C. Baker did not write his book on the history of the NDP; it was ghost written. One of the best historians in the field today has gone so far as to question whether or not Baker ever READ his book. The Colonel was also very well known as a prevaricator. Yes, Baker’s ghost writer was Phineas Camp Headly, a New England writer. He was a classic creative writer and magazine writer and a one time journalist I believe. He wrote many books-one about Josephine and the French Revolution. And of course Baker could never have wriitten ‘ ;;;A History of the US Secret Service’, or even read his own book, being the head of the NDP of which his book coined it to be the Secret Service…an idea from the French possibly. Neither did he give away classified secrets from the War Dept. before he suddenly died 2 years later. So where did Headly get all his inside data? Baker denied ripping the pages from the out of date 1864 red pocket book diary, published by James M Crawford of St. Louis; when up before a Senate committee, as did Stanton. Someone was lying and Baker was the best liar of all.